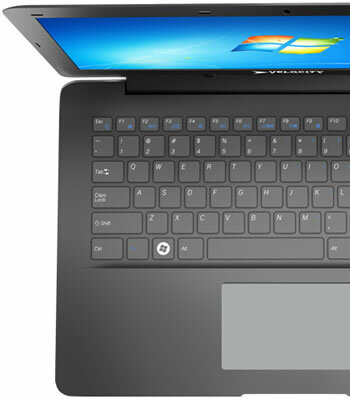 Boutique system builder Velocity Micro has expanded its mobile offerings with a new ultrabook range that includes three machines: the NoteMagix U430, U450 and U470. On the most affordable end of things, the U430 starts at $799.99 and offers a 14-inch 1366x768 anti-glare display, an Intel Core i3-3217U processor, 4GB of memory, a 500GB hard drive with 24GB of flash storage, a DVD burner and a 720p webcam. Scaling upward, the U450 goes for $899.99 and replaces the 1.8GHz Core i3 with a Core i5-3317U, which has a base clock of 1.7GHz and a Turbo frequency of 2.6GHz. The extra $100 also gets you a 120GB Intel 520 Series SSD instead of the U430's hybrid solution. If you're willing to plunk down another $200 ($1,099.99), the U470 pushes that to a Core i7-3517U (1.9GHz base, 3GHz Turbo) and a 240GB Intel 520 Series SSD. Connectivity seems shared across all three variants. Their spec sheets mention gigabit Ethernet, 802.11n Wi-Fi and Bluetooth, while a picture on the company's site reveals two USB 3.0 ports, an HDMI port, a card reader and an audio jack on the right side of the machine. The left side of the system is likely occupied by the above-mentioned optical drive, which also presumably accounts for the lineup's relatively bulky size. All three systems weigh four pounds and measure 0.82 inches (21mm) thick -- roughly half a pound to a whole pound heavier and a few millimeters thicker than most competing models. Battery life doesn't appear to be a particularly strong point either with a claimed run time of six hours or so. On the bright side, Velocity Micro will let you choose between Windows 7 and Windows 8, and your system will ship bloatware-free.